DTMF stands for Dual Tone Multi Frequency. It is more commonly known as Touch-Tone, previously AT&T’s registered trademark of DTMF. It is the system activated when you dial the numbers on the keypad of your phone. The resulting tones send instructions to switch boards to redirect your call. 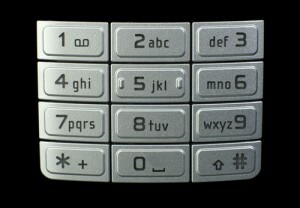 Each number on your keypad is associated with two tones – a combination of a high and low frequency tone. These dual frequencies are interpreted by decoding equipment to reroute your call or access specific information. The two-tone combinations help to ensure that the equipment does not confuse where your call should be directed. DTMF phones were first accessible to the public in the 1960s. They were created to replace rotary phones and, as Engineers Garage describes, ultimately operators who manually controlled the switch boards. Today, these DTMF systems are commonly utilized, especially within large corporations including banks, general businesses, and even doctors’ offices. Is this interaction beneficial for a customer? Customers who are calling customer service often want quick, and immediate assistance. They do not have time to be bothered with an endless maze of menu options that frequently end with talking to a customer service agent anyways. There are many magazines, articles, and more (PC magazine is a prime example) writing tips to help customers actually speak to a human on the other end of the line. This demonstrates the evident need for actual customer service representatives in place of automated menus and redirects. Although systems like DTMF may be beneficial to companies in the short-term, when it comes to hiring less people to manage the phones, they may be losing customer satisfaction and loyalty in the long-term. Interaction – although work is being done to make machines and messaging systems more interactive (ex: Siri for Apple’s iPhone), no automated system can completely replace the interaction of speaking to an actual person. Agents can explain answers to questions in more detail, and offer various solutions, as well as direct your call to a more appropriate person if necessary. Complex problem solving – as lifehacker explains, although automated systems can be utilized to answer simple questions, therefore cutting down on the amount of employees needed for a call center, any beyond-basic question requires the knowledge of a human on the other end of the line. Shorter wait time – with such active lives, no one has time for long waits for a single question to be answered. Time magazine describes how many people actually preferred automated systems like ATMs since it cuts down on wait-time when compared to speaking to a teller. Automated systems over the phone, however, often take much longer than speaking to an agent directly since the caller has to listen to each menu item and the corresponding key. Overall, automated systems have their time and place. Customer service agents are still the best option to ensure customer satisfaction and loyalty.